Both artworks were made in collaboration with American artist Amy Balkin. 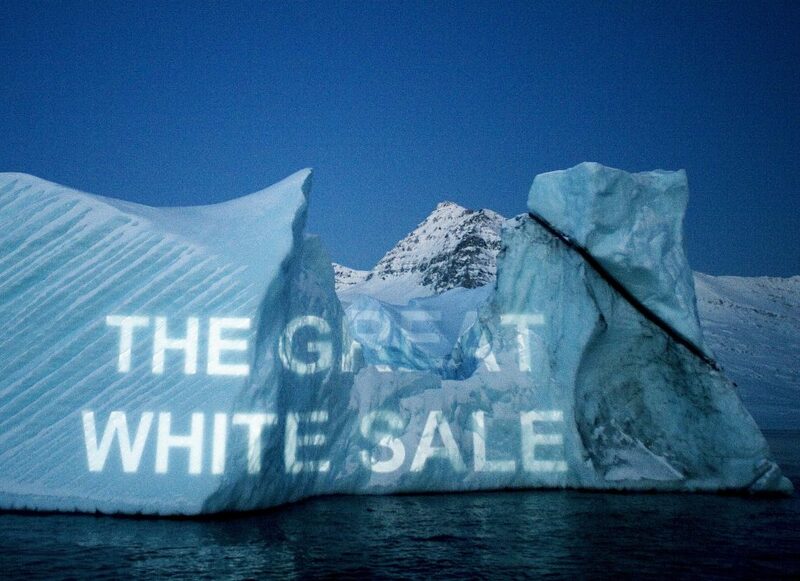 They were made by projecting text onto an iceberg in East Greenland and re-photographed. 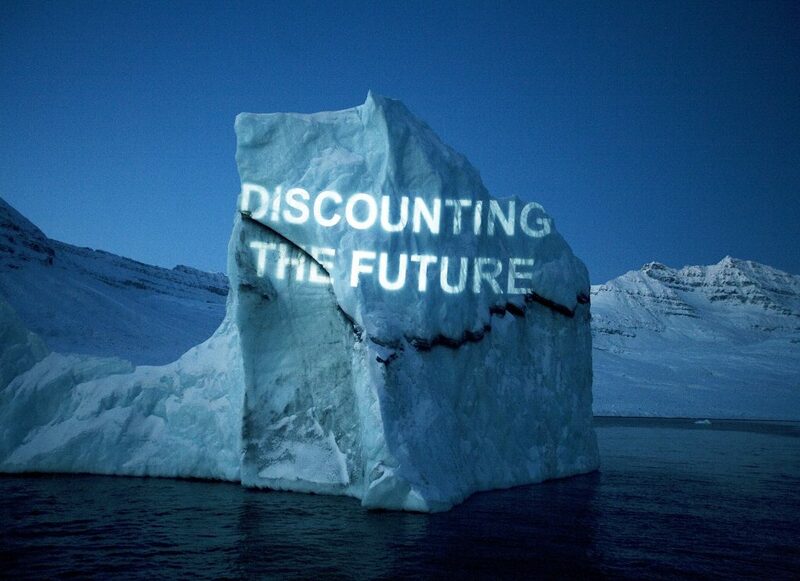 Created in 2008 during the world banking collapse, ‘Discounting the Future’ was a banking term commonly used at the time. In 2001 David Buckland created and now directs the Cape Farewell project, which without expectation has become a global entity. The work of the artists and climate scientists have been the subject of two major films, Art From The Arctic for the BBC and Burning Ice for Sundance, both produced by Buckland. In 2019, Cape Farewell continues its mission with “Kõmij Mour Ijin/Our Life Is Here,” a Cape Farewell Arts/Science Expedition to the Marshall Islands in the Pacific Ocean, March 2019. The notion that art can interrogate the future with some semblance of rigor has been analyzed and researched and become instrumental in facing the challenge of climate change. Buckland has co-curated major climate art exhibitions: Art and Climate Change for the National History Museum, London 2006; Earth for the Royal Society of Arts; U-n-f-o-l-d which has toured worldwide; Carbon 12 for the EDF foundation gallery in Paris, 2012; Carbon 13 for the Ballroom Texas, 2013; and Carbon 14 exhibition and festival in Toronto 2013/14. David is a designer, artist and film-maker whose lens-based works have been exhibited in numerous galleries in London, Paris and New York and collected by the National Portrait Gallery, London, the Centre Georges Pompidou, Paris, the Metropolitan Museum, New York and the Getty Collection, Los Angeles, and the Michael Wilson Collection, among others. In 1999 David presented a one-man show of digitally mastered portraits of Performers at London’s National Portrait Gallery, which attracted over 100,000 visitors. Five books of his photographs have been published including works on the Trojan Wars and The Last Judgment, featuring the sculptures of Sir Anthony Caro, and two monographs of his own work. He has designed over 20 stage sets, as well as costumes, for Siobhan Davies Dance, the Royal Ballet, Rambert Dance Company, Second Stride and Compagnie Cré-Ange. This work was displayed at the Nansen Initiative Global Consultation, October 2015, as part of the Island Tables installation.